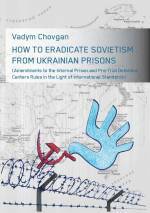 How to Eradicate Sovietism from Ukrainian Prisons. Amendments to the Internal Prison and Pre-Trial Detention Centers Rules in the Light of International Standards / Vadym Chovgan; CO «Kharkiv Human Rights Protection Group». – Kharkiv: Human Rights Publisher, 2018. – 292 p.
This publication is the first comprehensive attempt to familiarize the public with the problems of Internal Rules of Ukrainian prisons. It contains proposals of amendments to the Internal Pre-Trial Detention Center Rules, as well as to the Internal Prison Rules (Part I and Part II). The pro-posals are intended to implement international standards, such as recommendations of the Euro-pean Committee for the Prevention of Torture and judgements of the European Court of Human Rights. The author points out the shortcomings of both current Rules, which are considered to be leftovers of the Soviet Union, and should therefore be changed in the light of modern approaches to prisoners’ rights. The publication also contains draft amendments to the Internal Pre-Trial Detention Center Rules, as well as to Internal Prison Rules developed by the Ministry of Justice in August 2017. Their translations are unofficial and made for information purposes only (Part III and Part IV).